Boeing’s deal to turn two 747s into flying White Houses is actually somewhat sweeter than its initial $3.9 billion price tag. A newly released Air Force contract document shows that the Chicago-based aerospace giant will also receive a no-bid contract likely worth hundreds of millions of dollars to maintain the two jets for five years. Produced in May and posted on July 20, the document says Boeing’s logistics contract will cover the procurement, repair, and overhaul of spare parts; engine maintenance and overhauls; support equipment; and training. It also says the Air Force contracting team convinced Boeing to turn over data “above and beyond what is normally provided to 747-8 purchasers.” That info could allow the Air Force to put logistics work for the planes out for bids after Boeing’s five-year deal runs out around 2029. The document is a “justification and approval” form required for no-bid contracts; it’s fairly common for the Pentagon to award maintenance and logistics work to an aircraft’s manufacturer. 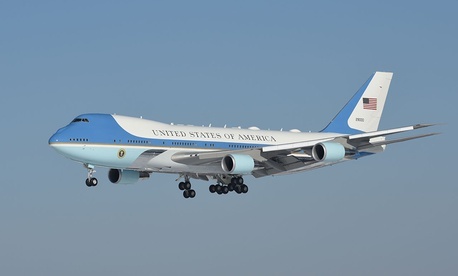 For the current pair of Air Force One aircraft, the service paid Boeing more than $350 million between 2009 and 2017 for logistics support, according to GovTribe, a website that tracks federal contracts. The document also reveals details about the planes themselves. Boeing built the jetliners for a Russian airline that went bankrupt before they could be delivered; they were purchased last summer by the Air Force and have since been sitting in storage at an aircraft boneyard in the California desert. The 747s come with an eight-year warranty, which covers the commercial parts on the plane, not the military ones that will be installed in the coming years. The planes are expected to enter service in 2024. Two new doors on the left side of the plane — one in front and one behind the wing. Those doors will have fold-up stairs that all passengers to board and unload without using airstairs. Special military GPS will be installed in the 747-8 flight deck. The planes’ commercial transponders will be replaced with military transponders. Boeing will remove the plane’s single auxiliary power unit, replacing it with two new units that will generate power in flight.